Horleys - Lean Gain for lean muscle growth. With low GI carbs & high quality proteins. The best time to use Lean GAIN is within 30 minutes of a training session to optimise muscle repair and recovery. It's also ideal between meals and before bedtime to boost energy intake. Use Lean GAIN in addition to regular nutritious meals and with an exercise program that includes weight training. Add 50g (approximately 4 scoops) to 300mL standard milk and mix well. Tip: For a thick smoothie, add a banana, 2 tablespoons of yoghurt and 3 scoops of Lean GAIN to 300ml of milk or fruit juice and whizz in a blender. For extra calories and nourishment to support lean muscle gains, ice cream or an egg can be added. Protein Blend [Whey Protein Concentrate (33%), Whole Milk Powder, Skim Milk Powder], Maltodextrin, Cocoa, Medium Chain Triglycerides (3%), Flavours, Thickener (Xanthan Gum), L-Glutamine, Minerals (magnesium phosphate, magnesium oxide, zinc sulphate, ferrous fumarate, potassium iodide), Vitamins (vit. A (beta carotene + vit. A acetate), sodium ascorbate, vit. E acetate, niacin, vit. D, pyridoxine hydrochloride, thiamin hydrochloride, riboflavin, folic acid), Magnesium Oxide, L-Leucine, Sweetener (Sucralose), Digestive Enzymes. Learn more about achieving your goal of muscle mass gains over on our blog. Readily absorbable complete nutrition, with low GI carbs and protein for muscle repair and growth. BEST FOR: those who want to build muscle but struggle to gain weight; sports people who expend large amounts of energy & don’t have time to recover with full meals, e.g. triathlon, rowing, cycling, running, multi-sport, etc., or physically demanding jobs; underweight men, women and teens, and to support people who are recovering from illness or trauma, or have poor appetite, to fulfill daily nutritional requirements. 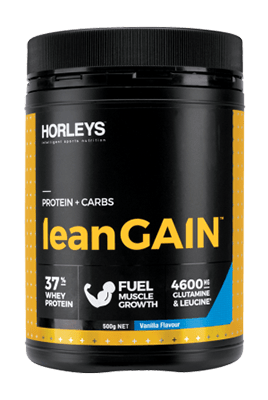 Lean GAIN is specially formulated with the readily absorbed low GI carbohydrates and high quality proteins required for lean muscle growth. It’s nutrient rich with added ingredients for faster results and optimum body functions.